The Americans are not comfortable with the maxim Blood Will Out~a notion universally accepted everywhere else. This is understandable~as~~defying bloodlines~~defines the Americans. The Americans are taught that a man can come from nothing~~poverty, socially suspect blood lines, lack of any discernible brilliance~~and yet he can attain the highest positions in commerce and politics by dint of diligence, cunning and hard effort. The English and The Continentals~~having more history upon which to reflect~~know that attainment is in one’s blood~~a disquieting consideration to the Americans. Comes into this mix now, Galileo~~bred to racing blood royal~~a magnificent champion at the races, a astounding sire in the shed and now–a sire of champion sires. The klatch salutes Galileo as one more of his grandsons, Trading Leather~won the Irish Derby today~~himself besting The Epson Derby winner~~ Ruler of The World~~himself another of Galileo’s sons. This season, The English Derby, French Derby and Irish Derby have been won by three, different, sons or grandsons of Galileo. 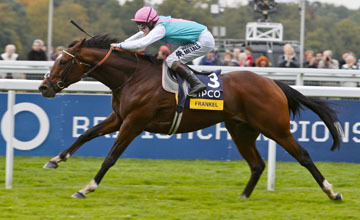 He faced real adversity for the first time in his glory-strewn career yesterday, but Khalid Abdullah’sgreatest gift to racing, Frankel (GB) (Galileo) duly overcame unfavorable testing ground and a blown start to sign off victorious in the G1 QIPCO Champion Stakes at Ascot. Long targeted at the £1.3-million race that could almost have been revamped with him in mind, the sell-out audience and millions glued to TV sets and the internet around the world were made to wait until late morning for him to be confirmed a definite runner after persistent rain in the week had turned the Berkshire turf to heavy in places. Memories of his blitz on Newmarket’s slick surface in last year’s 2000 Guineas led the mind to wonder if he could cope with a slog in these conditions, and the usual flood of cash was stemmed slightly to produce a starting price of 2-11. 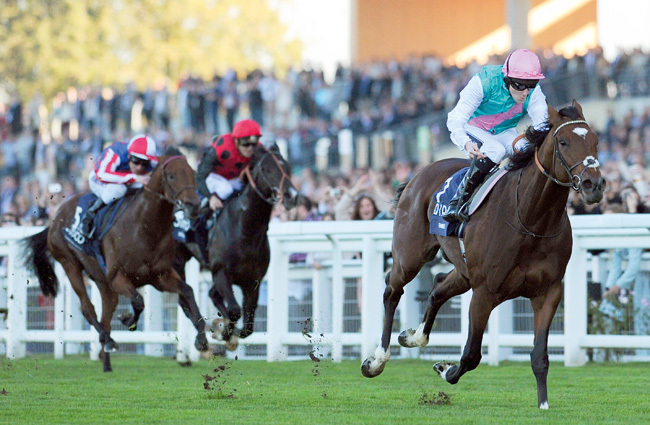 As the clouds broke over Ascot in the build-up to this finale, the tension rose in parallel, and a final bout of showers on Thursday into Friday created a crucible in which his champion status would be challenged most acutely. Months of nurture and expert horsemanship saw him enter the buzzy parade ring with nonchalance, and that casual air saw him surrender a normally crucial margin of three lengths out of the stalls. Ian Mongan on Bullet Train (GB) (Sadler’s Wells) dropped anchor in front to allow Tom Queally to ease into the pack, which forced Olivier Peslier on Cirrus des Aigles, to take up the running after 1 1/2 furlongs, with Frankel coasting along in fourth. Bullet Train came back to pester the French raider and was in front again on the approach to the home turn, but by now his customary honest pace-setting role had been shot to pieces, and as Cirrus des Aigles took control with Peslier apparently full of horse at the top of the stretch, Frankel was still over two lengths down. 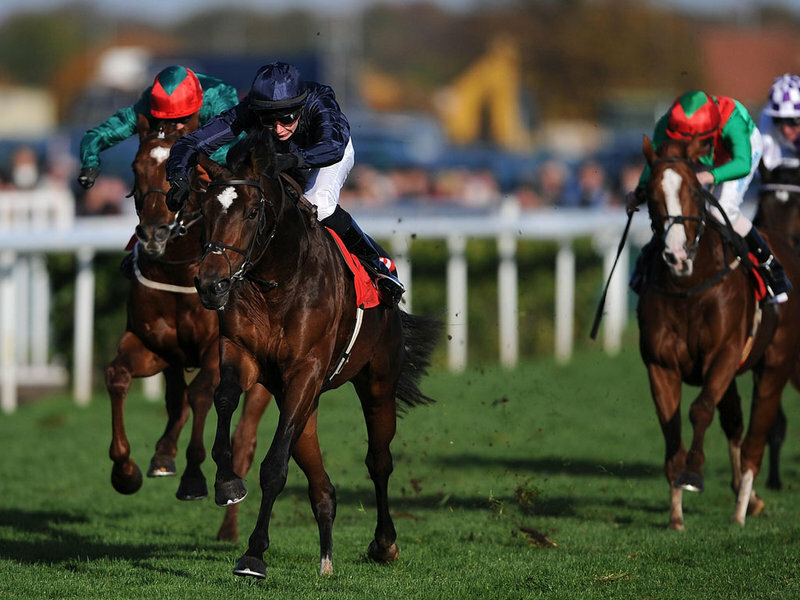 That deficit had been wiped out with the minimum of effort by the furlong marker, where Queally became animated for the first time, and after administering one slap with the whip with just over 100 yards left to race, immortality was sealed. Galileo, a 15-year-old son of Sadler’s Wells, has led the combined English/Irish sire list in four of the past five years. From a statistical viewpoint, the late Sadler’s Wells was the greatest sire in English and Irish Thoroughbred history. Not only did he lead the combined English/Irish sire list for a record 13 consecutive seasons and a record 14 times overall (beating records set by Highflyer two centuries earlier), but he sired 329 stakes winners, a record for a horse who served only in the Northern Hemisphere. Both of those records might well be in jeopardy in less than a decade’s time, however. And in the spirit of the hit television series “Game of Thrones,” the horse who may dethrone Sadler’s Wells is his own son Galileo. 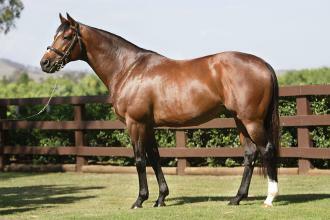 At age 15, Galileo has led the English/Irish sire list in four of the past five years (a feat Sadler’s Wells had accomplished by age 14), and his total dominance of the European classic scene was never more evident than on the first weekend of June, when his sons Ruler of The World and Intello swept the Epsom Derby and Prix du Jockey Club, France’s Derby equivalent. That derby double was immediately preceded by the victory of Galileo’s paternal granddaughter Talent in the Epsom Oaks. Talent’s sire, New Approach, could be the horse to extend the “Game of Thrones” metaphor one generation further. Talent is the sixth stakes winner and second classic winner among the 95 foals in New Approach’s sensational first Northern Hemisphere crop. New Approach’s first classic winner, the 2012 champion European 2-year-old colt Dawn Approach, started as the heavy favorite in Ruler of The World’s Epsom Derby but threw away his chance by frantically fighting his jockey’s attempt at restraint for the first mile. New Approach, nevertheless, sired the Derby’s second-place finisher in Libertarian, the winner of the Group 2 Dante Stakes on May 16. Galileo’s dominance of the Derby field was unprecedented in the modern era. Coolmore’s champion sired five of the 12 runners himself, and New Approach’s two runners meant that more than half the field were Galileo’s sire-line descendants. Three of Galileo’s sons, Ruler of The World, Galileo Rock, and Battle of Marengo, bracketed second-placed Libertarian in the first, third, and fourth positions at the wire, while a fourth Galileo horse, Mars, was a close-up sixth. Galileo came the closest to siring the first three finishers in the Epsom Derby since the “Emperor of Stallions,” Stockwell’s Triple Crown winner, Lord Lyon, led home his paternal half-brothers Savernake and Rustic in 1866. Only one other stallion, Highflyer’s best son Sir Peter Teazle in 1803, has sired the first three finishers in the Derby. Galileo, New Approach, and Galileo’s champion son Teofilo accounted for five of the 11 Oaks runners, and Galileo’s daughters Secret Gesture and Moth finished second and fourth behind Talent. Intello was the only colt by Galileo in the French Derby (his grandson Loch Garman, by Teofilo, finished 10th), but Intello dominated the race all by himself, easily following two pacesetters before pouncing in the final two furlongs and winning comfortably by two lengths over Morandi, by Holy Roman Emperor. In his long career at stud, Sadler’s Wells sired two Epsom Derby winners (Galileo and High Chaparral), six Irish Derby winners (Galileo, High Chaparral, Montjeu, Dream Well, Old Vic, and Salsabil), three French Derby winners (Montjeu, Dream Well, and Old Vic), and seven winners of the three Oaks equivalents (Intrepidity, Alexandrova, Salsabil, Dance Design, Imagine, Ebadiyla, and Moonshell). Galileo has a ways to go to match that record, but if he lives long enough, he is well on his way. Ruler of The World was his second Epsom Derby winner and Intello his first winner at Chantilly, but he has sired Irish Derby winners Cape Blanco, Soldier of Fortune, and Treasure Beach, as well as Epsom Oaks winner Was, French Oaks winner Golden Lilac, and Irish Oaks winner Great Heavens. All three of last weekend’s classic winners are from superb female families, but Intello’s pedigree is especially notable. The second foal out of 2006 Group 2 Prix de Sandringham winner Impressionnante, Intello is the seventh European classic winner or champion by Galileo out of a mare by the late, great sire and broodmare sire Danehill. That list is headed, of course, by the undefeated Frankel but also includes French Oaks winner Golden Lilac and European champion 2-year-old colt Teofilo. Impressionnante is a half-sister to Group 3 winner Only Answer, and their dam, Occupandiste, by Kaldoun, won two Group 1 races and was the European highweighted filly at age 4 at seven to nine furlongs. 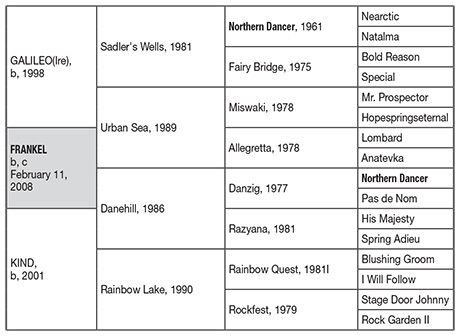 Occupandiste’s dam, Only Seule, by Lyphard, was a half-sister to 1994 Irish 1000 Guineas winner Mehthaaf, by Nureyev, and European highweighted sprinter Elnadim, by Danzig, from the great family of Fall Aspen. Ruler of The World possesses, if anything, an even better pedigree. 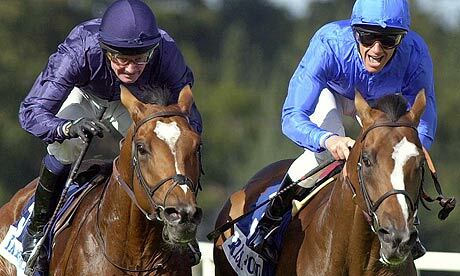 His half-brother Duke of Marmalade, by Danehill, was the champion older horse in Europe in 2008, when he won five Group 1 races, including the King George VI and Queen Elizabeth Stakes, and is now a promising second-crop sire. Their dam, the group-placed Love Me True, by Kingmambo, is a half-sister to Grade 2 winner Bite the Bullet, by Spectacular Bid, and stakes winner Shuailaan, by Roberto. Ruler of The World’s third dam, Lassie Dear, by Buckpasser, is the dam of four stakes winners, including European highweight Wolfhound, by Nureyev, and is the second dam of champion and two-time leading sire A.P. Indy, by Seattle Slew; classic winner Summer Squall, by Storm Bird; and champion and Belmont Stakes winner Lemon Drop Kid, by Kingmambo, as well as the third dam of Breeders’ Cup Mile winner Court Vision, by Gulch. 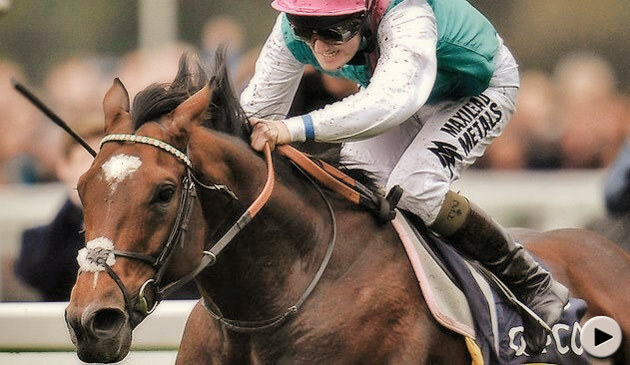 Even with all that pedigree firepower on display, Oaks winner Talent holds her own on pedigree. Her dam, Prowess, by Peintre Celebre, placed in the Cheshire Oaks, and Prowess’s dam, Yawl, by Rainbow Quest, won the Group 3 Rockfel Stakes. Talent’s third dam, Bireme, by Grundy, won the 1980 Epsom Oaks and comes from a family that has been prominent in races with “Oaks” in their name since her third dam, Felucca, by Nearco, produced 1955 Yorkshire Oaks winner and Epsom Oaks runner-up Ark Royal, by Straight Deal. 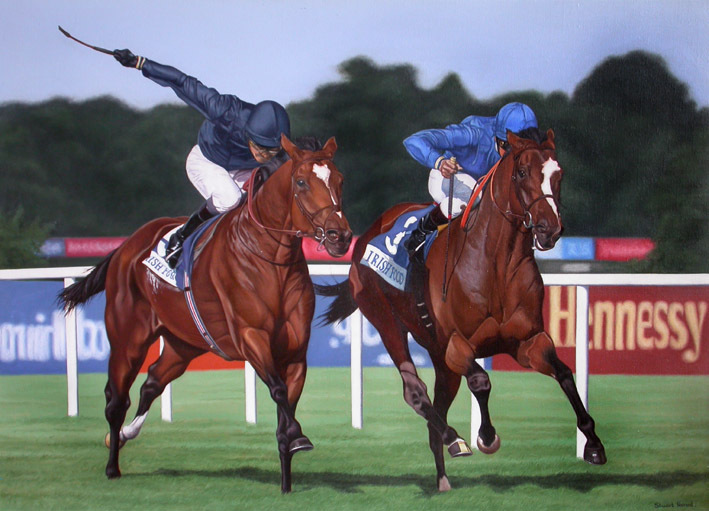 Ark Royal’s half-sister Cutter, by Donatello II, finished third in the Epsom Oaks, won the Yorkshire Cup, and produced four group-class stakes winners. 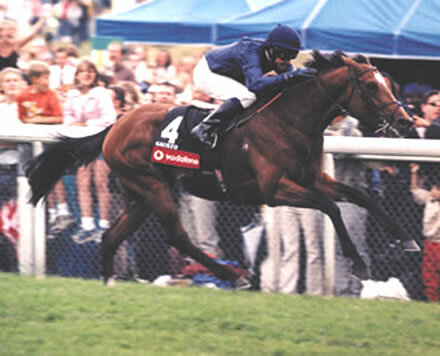 Cutter’s grandson Cut Above, by High Top, won the 1981 St. Leger Stakes, and her great-granddaughter Bolas, by Unfuwain, captured the 1994 Irish Oaks. A felucca is a traditional wooden sailboat used on the Nile and the Red Sea, and the late Reginald Hollingsworth, the owner and breeder of Felucca, favored nautical names for her descendants, as names like Bireme, Buoy, Anchor, Mariner, and Kyak attest. That tradition is long gone, but the talent remains in Felucca’s female line. It remains to be seen how serious a challenge New Approach can raise to his sire’s hegemony. New Approach was a much better 2-year-old than Galileo, winning all five of his starts, compared with Galileo’s solitary win at 2. His trainer, Jim Bolger (also the trainer of Dawn Approach), who bought New Approach for about $550,000 at the Goffs Orby sale in 2006 and sold an interest in him to Sheikh Mohammed bin Rashid al Maktoum after his undefeated juvenile season, revealed in the run-up to the Epsom Derby that New Approach is heterozygous for the misnamed “speed gene” promoted by the genetic testing company Equinome, while his sire, Galileo, is homozygous for the more stamina-oriented allele at that site. Dawn Approach, on the other hand, is homozygous for the short-distance-oriented allele, which initially made Bolger reluctant to run him at Epsom. Bolger owns a financial interest in Equinome, so it is in his interest to promote both New Approach and Dawn Approach as speedier alternatives to the best sire in the world. On and on the blue blood flows~~from one great sire to his sons and grandsons and beyond. The Sport of Kings endures and suggests that those who maintain the Blood Will Out have history on their side. The Americans are far less inclined than are the English and the Europeans to accept the maxim that Blood Will Out. This is understandable~~as~~defying bloodlines~~defines the Americans. Yet that presumption of lineal defiance puts the Americans in this very awkward position~~How does one then explain Galileo~~and~~more so yet~~his children~~and now yet~~his grand children? The Americans are not comfortable with the maxim Blood Will Out~~a notion universally accepted everywhere else. The Americans are taught that a man can come from nothing~~poverty, socially suspect blood lines, lack of any discernible brilliance~~and yet he can attain the highest positions in commerce and politics by dint of diligence, cunning and effort. The English and The Continentals~~having more history upon which to reflect~~know that attainment is in one’s blood~~a most disquieting consideration to the Americans.